Perfecting your nursery is one of the most fun parts of pregnancy. It’s incredible to just sit in there and daydream of all the time you will spend with your baby cuddling, feeding, changing, and playing. Besides paint colors and finding a perfect nursery glider, one of your biggest concerns will probably be finding just the right baby crib. You have got plenty of great options in this furniture category and we’ve broken down the very best baby cribs for you into a list. Cost- Babies are so little, but oh so expensive. While the best baby cribs are obviously important, don’t go bankrupt trying to buy the most on-trend expensive one you can find. Make this one of your practical purchases, especially because so many cribs these days are convertible and you’ll be able to use them well into your baby’s childhood. Not to mention, your crib probably won’t even get used until about month 6 unless you’ve really got your stuff together as some sort of super mom. Convertible or Not- Like we already said, most best baby cribs these days are convertible. If you can’t find an option you love it’s not the end of the world, but definitely check some out. Make sure you take a look into exactly how they convert and if you still like the way they look and function in all stages. Shape- One of the biggest things that differs from crib to crib is the shape. Think about what will fit best in your nursery or perhaps in your own room if you’d like baby close to you. Some cribs are huge, others are tiny. There’s circles, rectangles, ovals. It’s really just a personal choice, but know there are tons of options out there. Safety- Crib safety is of utmost importance. It’s so scary to lay your baby down to sleep and leave the room no matter what, but it’s good for them and having one of the best baby cribs will make you feel so much better. The guidelines are always changing, so make sure to ask your pediatrician about it and do some research. Another important thing is to adjust the crib according to your baby’s abilities. If they can pull themselves up or stand, the mattress needs to be lowered. Also, look into guidelines about crib bumpers, blankets, and anything else you put into your baby’s bed. 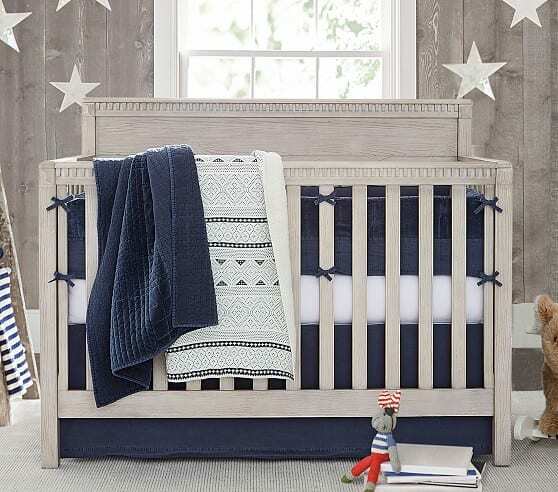 This crib from Pottery Barn makes our list for best baby cribs because not only is it absolutely adorable but it also is very functional.. The crib transforms from a crib to a toddler bed and then to a complete twin bed. Another thing that I love about all of Pottery Barn’s crib furniture is they are GREENGUARD GOLD Certified which means that the crib passes the most strict guidelines for chemical emissions standards, so you know that your baby will not near any harmful chemicals. Check Current Prices Here! 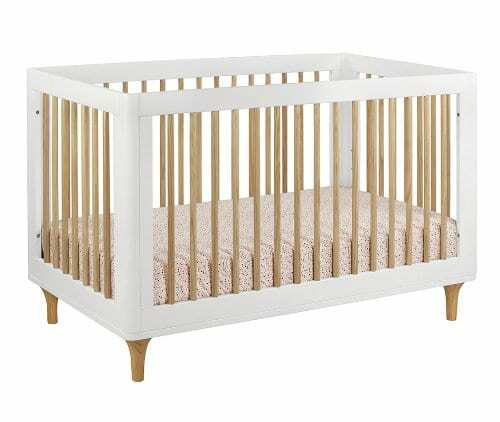 This crib is simple, modern, and will fit right into any room you bring your baby home to. It’s reasonably priced and comes in 7 different great colors. It goes from a crib to a toddler bed to a big kid bed, each designed with safety in mind. Check Current Prices Here! 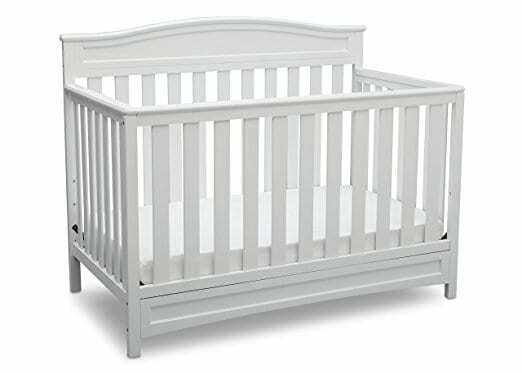 This crib is a classic beauty and exactly what nursery dreams are made of, at a steal of a price. It comes in 3 different colors and converts from a crib all the way to a full-size bed with a pretty headboard. It meets and even exceeds safety standards. 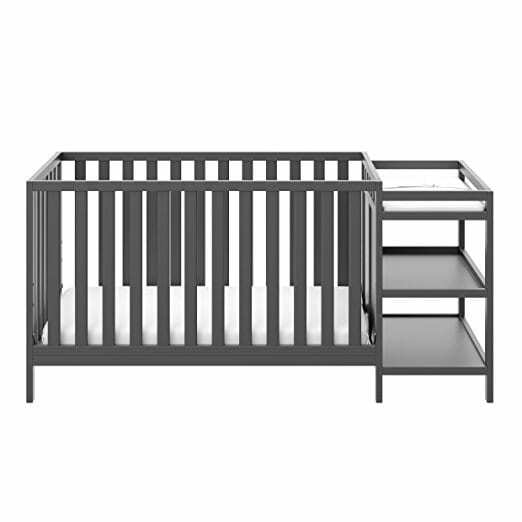 It’s one of the most sturdy cribs you’ll find. Check Current Prices Here! 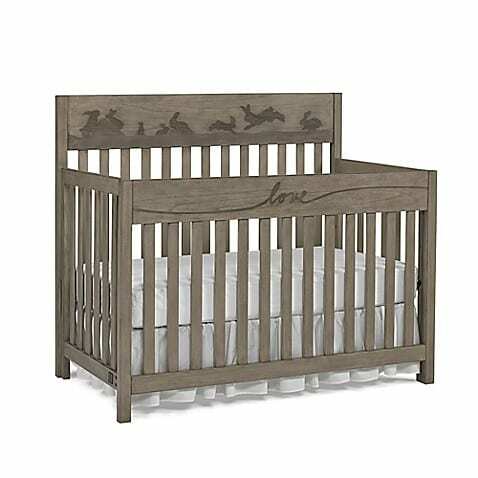 This is another beautifully crafted and still reasonably priced crib. We love the timeless cherry wood color. It converts easily and passes safety standards with flying colors. Check Current Prices Here! 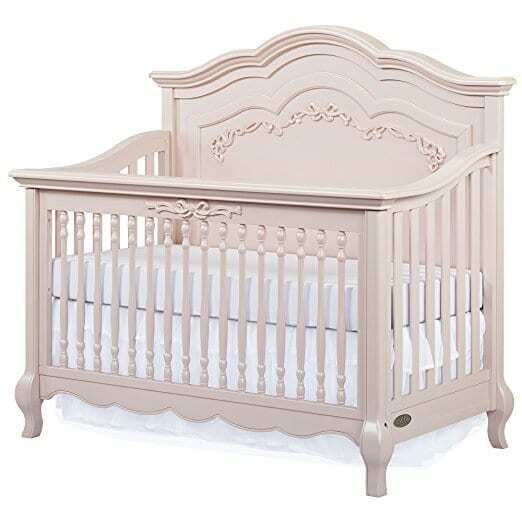 This crib is so pretty, and Sorelle is a well trusted furniture company so you know your baby will be safe in this crib. It does convert, but you’ll need to purchase extra railing separately to make that happen. Check these out! Graco just knows how to do it right, and they checked all the boxes with the Lauren Crib. It’s sleek but still durable. The mattress height is very easy to adjust and conversion is easy as well. It can be made into a full sized bed with the purchase of an extra metal frame. Parents also rave it’s easy to build, which pregnant mamas will actually appreciate. Check Current Prices Here! Can you say modern? This crib couldn’t get any cooler, so it’s perfect for all you trendy mamas. It’s beautifully designed and surprisingly can still be converted! It’s crafted in a partnership between West Elm and Pottery Barn, double the quality. Check these out! 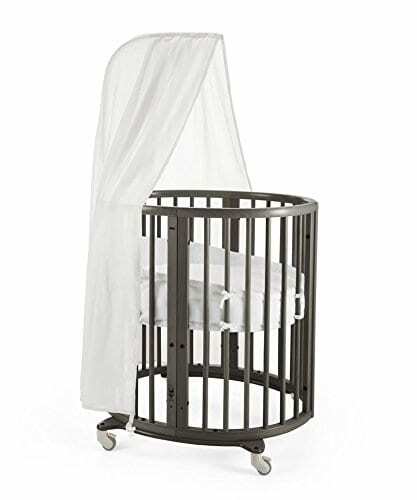 And again, with an extremely cool and unique option we present to you the Sloan Acrylic Crib which has clear see through bars. It will give your nursery a very open feel, which is great for small bedrooms. It’s made with expert craftsmanship and meets all safety standards. Check these out! That’s right, the Ellen Degeneres has created the ultimate crib for all her newest fans. Not to mention, it’s super cute with animals carved into the headboard. It’ll go pretty perfect in a woodland themed nursery and then bedroom. Check these out! Stokke might be known for their strollers, but they do a pretty great job with this unique crib. It’s a small round crib that will fit just about anywhere in your home. It’s also on wheels so it can be easily moved around. The mattress base is very easily adjusted for your convenience. Check these out! This is the ultimate little boy bed in its pretty slate blue color. It’ll fit perfectly into the scenes of pirates, race tracks, or fishing holes all while still looking elegant. The other awesome thing about this crib is the storage underneath. There are 2 whole deep drawers! Check these out! If you will be bringing home a little princess, you might want to check out this crib fit for royalty. It is absolutely gorgeous and comes in the prettiest soft pink color. It converts all the way into a full bed, so this is something your little girl will have throughout her childhood. There is a whole set of furniture made especially to go with this crib if you’re looking for furniture to match. Check these out! 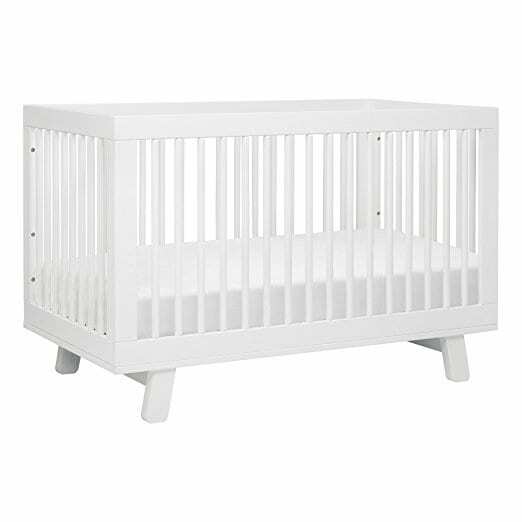 This simple crib will provide your baby somewhere comfy to sleep, yet easy for mom or dad to reach in and grab them out of. It is one of the best-priced Pottery Barn cribs, but built with their same integrity and superb design skills. It converts from a crib to toddler bed easily and has three mattress height positions. Check these out! I absolutely love the look of this crib, which has a slight mid-century look but is still timeless. This crib comes in three different color schemes, which are each pretty cool. It meets all safety standards and has 4 adjustable mattress height positions. Check these out! 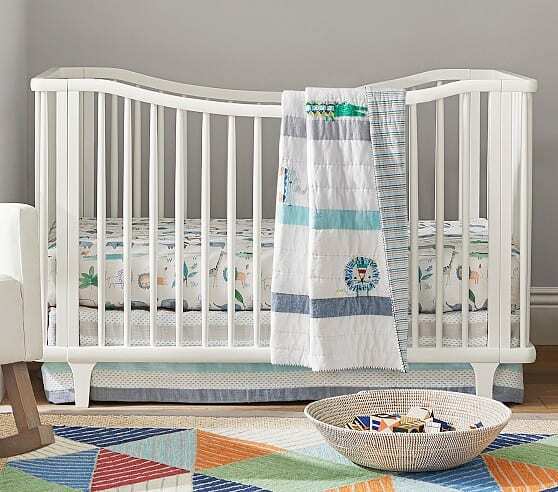 This is a crib you will never get tired of looking at, which is great news since your child can sleep in it all the way through their teen years. While it is pricey, it’s well worth the investment because it converts so easily and still looks like a very nice piece of furniture. This is another crib which you can purchase the whole furniture set for, and I am actually totally obsessed with the nightstand and dresser. Check these out! Last but not least, we introduce to you the Storkcraft which is a crib and changer all in one. It’s so convenient to have the changing table so close during late night changes and especially for early morning explosions. There are also two shelves for extra storage underneath the changing table. You will get all of this at a great price, making it hard not to love. Check these out! CHOOSING BEST CRIB ESSENTIAL FOR BABY SAFETY AND COMFORT.I AM TRYING TO BUY A CRIB FOR MY 6 MONTH BABY. BUT THERE ARE AVAILABLE CRIB IN THE MARKET. BUT CHOOSING BEST ONE IT’S REALLY DIFFICULT. THANKS FOR HELPFUL GUIDE TO CHOOSE BEST ONE FOR MY LITTLE ONE.